2. The United States as Mediator? At the beginning of 1989, the Mozambican government’s line regarding a peace process consisted of a steadfast refusal to negotiate directly with Renamo, still officially designated as «armed bandits». This position was based on a reluctance to grant political legitimacy domestically to an organisation seen, with some justification, as mainly dependent on South African support. In December 1988, according to his own version of events, the South African foreign minister, Pik Botha, had suggested to the Mozambican government that the United States might act as a mediator, and this story broke in February 1989. State Department spokesperson Charles Redman cautiously stated on behalf of the incoming George H. W. Bush administration (January 1989-January 1993) that the US might consider a request were it to come from Mozambique itself. As it turned out, both the Mozambican government and representatives of Renamo in Lisbon were less than keen. Maputo commented that it might consider a ‘complete proposal’; Renamo rejected a South African role, stating that only direct negotiations with the government could bring an end to the fighting. By the end of the month, Botha had backed down. Reports from Lisbon in this period stated that Soviet and other military support was likely to be scaled down, as pressure apparently continued to mount on the government to find a political solution to the conflict. Moçambique: o governo na encruzilhada. África Confidencial [Lisbon] (14 January 1989). In Portuguese. Click here to download a PDF file, size 165 kb. The Portuguese newsletter argues that while the Mozambican government registered significant diplomatic gains during 1988, the military situation failed to improve. The country’s allies are sceptical about the chances of military victory over the MNR. Moçambique não dialogará com BA’s, reafirma embaixador do nosso país no Zimbabwe. Notícias [Maputo] (23 January 1989). Francisco Madeira repeats the Frelimo line on negotiations, when leaving at the end of his term as ambassador in Harare. 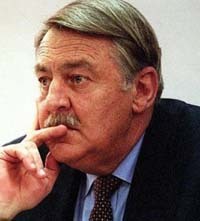 Pik Botha urges peace plan for Mozambique. Foreign Broadcast Information Service (FBIS) [Reston VA] no.FBIS-AFR-89-025 (8 February 1989). In English. Click here to download a PDF file, size 38 kb. Transcript of a broadcast by Capital Radio, Umtata. US prepared to consider mediation request from Mozambique. 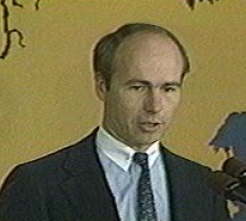 State Department Briefing [Washington DC] (8 February 1989). In English. Click here to download a PDF file, size 79 kb. Story reference: AE3030208. William Claiborne. Pretoria seeks US, Soviet mediation to settle civil war in Mozambique. Washington Post [Washington DC] (8 February 1989), p.A34. In English. Click here to download a PDF file, size 236 kb. This is not the original clipping, but a transcript from an information service distributed by the US embassy in Harare, Zimbabwe. Above: Charles Redman, US State Department spokesman [left]; and Pik Botha, South Africa’s Minister of Foreign Affairs [right]. Botha proposed to the new Bush administration in early February that the US act as mediator in Mozambique. Redman announced that the administration might respond to a request from Mozambique itself. Christopher S. Wren. Pretoria asks US aid on Mozambique peace. New York Times [New York] (8 February 1989). In English. Click here to download a PDF file, size 197 kb. This is not the original clipping, but a transcript from an information service, distributed by the US embassy in Harare, Zimbabwe. US offers to mediate Mozambican peace. Herald [Harare] (9 February 1989). In English. Click here to download a PDF file, size 34 kb. The original proposal for a US role came from Pretoria. The US response indicated a willingness to consider any request from Mozambique itself. Negociações com a África do Sul para o fim da guerra: Moçambique só se pronunciará com base de propostas completas. Jornal de Angola [Luanda] (10 February 1989). In Portuguese. Click here to download a PDF file, size 40 kb. [Untitled news item]. Star [Johannesburg] (11 February 1989). In English. Click here to download a PDF file, size 41 kb. Speculative article on possible mediation in a peace initiative, after Pik Botha’s visit to Maputo, where he met President Chissano. Retyped (not by MHN). Renamo rejects plan. Windhoek Advertiser [Windhoek] (14 February 1989). In English. Click here to download a PDF file, size 21 kb. Renamo rejects RSA-proposed peace plan. Foreign Broadcast Information Service (FBIS) [Reston VA] no.FBIS-AFR-89-031 (16 February 1989). In English. Click here to download a PDF file, size 26 kb. Transcript of a South African television broadcast in English. We’ll talk if MNR says no to violence: Chissano. Herald [Harare] (16 February 1989). In English. Click here to download a PDF file, size 62 kb. Silva Ramalho. Editorial: falando de guerra e de paz. Século de Joanesburgo [Johannesburg] (20 February 1989). In Portuguese. Click here to download a PDF file, size 141 kb. João Santa Rita. Mozambican peace initiative a tough task. Star [Johannesburg] (22 February 1989). In English. Click here to download a PDF file, size 171 kb. Points out that Pik Botha’s proposal that the US should mediate in Mozambique as it did in Angola is ‘puzzling’ because there are no real parallels between the two situations. [Untitled news item]. Marchés Tropicaux et Méditerranéens [Paris] (24 February 1989). In French. Click here to download a PDF file, size 34 kb. Reports that South Africa has given up on its attempts to involve the US as a mediator in the Mozambican conflict. A spokesperson is reported to have stated that ‘there is no place for the role of mediator played by a third party’. This page was posted on .